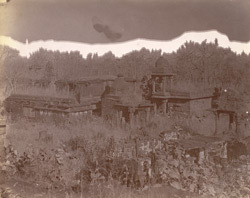 Photograph of one of the minor Jain temples at Deogarh taken by Edmund William Smith in the 1880s or 1890s. Deogarh is located in the modern state of Madhya Pradesh. The site is most famous for beautifully carved Hindu sculptures depicting scenes from Vishnu's life. These were found in the Dashavatara temple and are some of the most famous Gupta sculptures in India. Deogarh is also home to a group of Jain temples dating to the 9th and 10th Centuries. Situated inside the fort, the group includes the temple shown in this photograph. The best preserved temples have sculpture niches with Jain figures decorating the walls, richly ornamented towers and carved pillars.